First of all, long time no write! I have been too lazy to blog recently and I have a heyuuuge backlog of entries. Last week, I had to go to Singapore for business and stayed there for a six days. It was my first time (Second, technically. But my first one was just a stopover to Jakarta) to visit the prosperous city state and I was very excited. First stop… Legoland Malaysia! Rather than going around Singapore on my free day, I chose to go on an adventure to Johor Bahru and experience Legoland. I have been fascinated by Lego ever since I was a child and I grabbed the chance to see Legoland. I arrived in Singapore at around 11 AM of Monday. I went straight to Swissotel the Stamford and deposited my luggage. I rode the MRT to Bugis Station and walked to Queen Street where there’s a terminal for buses going to JB. In less than an hour, I was crossing the Singapore-Malaysia border. There was some time spent going through Malaysian immigration but it was bearable. The bus ride ended in JB Sentral where I had to wait for another bus, LG1, that goes to Legoland. Taken at JB Sentral. JB Sentral is one big railway/bus station. It puts some of the Philippines’ international airports to shame. I had around an hour and a half to spend before the next bus bound to Legoland arrives. It was around lunch time so I thought I’d get something to eat. I exchanged some of my Singaporean Dollars to Malaysian Ringgits and looked for a nice place to eat in. I ended up in an eatery inside JB Sentral. Chicken curry for 4.5 MYR. Not bad. When the bus LG1 arrived, I asked the driver if the bus will be going to Legoland, just to be sure. A little Bahasa went a long way, the driver didn’t understand English much. The fare was reasonable, 4 MYR which is around 52 PHP. The trip was almost an hour long and I kept falling asleep in the bus. Seeing the huge Legoland sign from afar made me giddy. The entrance ticket to Legoland costs 140 MYR which is a little over 1,800 PHP, quite steep if you ask me. I chose to charge it to experience. Haha! A tip though, if you are already certain about the day you’d be visiting Legoland, buy your ticket online. You’d get 30 MYR off if you book 7 days in advance. Inside, Legoland is mostly eye candy. There are a few rides but most of the attractions are best suited for kids. Still, I would be telling a lie if I said that I didn’t enjoy the place — I had a blast! Just seeing the intricate replicas of Asian tourist spots in Lego amazed me. Legoland’s divided into different themed areas. They have an area called Miniland wherein popular places are modeled in Lego. I was disappointed with the featured Philippine attraction though. They could’ve chosen Intramuros or the Rice Terraces but instead they chose a place even I am not too familiar with (Bolinao?). Angkor Wat, Petronas, Taj Mahal, Wat Arun, the list goes on! Hats off to the people who constructed these Lego replicas. Even under the blazing heat (without sunblock), I spent a lot of time checking out the different models in Miniland. I didn’t care, I was too amazed! It was Lego coolness all around! I tried some of the rides, namely Project X and Dino Trainer which are ‘roller’ coasters, Dino Island which is similar to Log Jam, Lost Kingdom Adventure which is a shooting game, and Wave Racers which is… a water ride that goes around and around. Sadly, I didn’t have pictures riding them. Boo. I also tried the 4D theater called Lego Studio. It was a big relief since it was very cool inside. I would’ve stayed there if I had the luxury of time. The movie shown was okay, I think they overused the ‘something-in-your-face’ 3D effect though. Another attraction I liked was the Observation Tower. Aside from the fact that it was air-conditioned, it gave me a nice view of the entire amusement park. 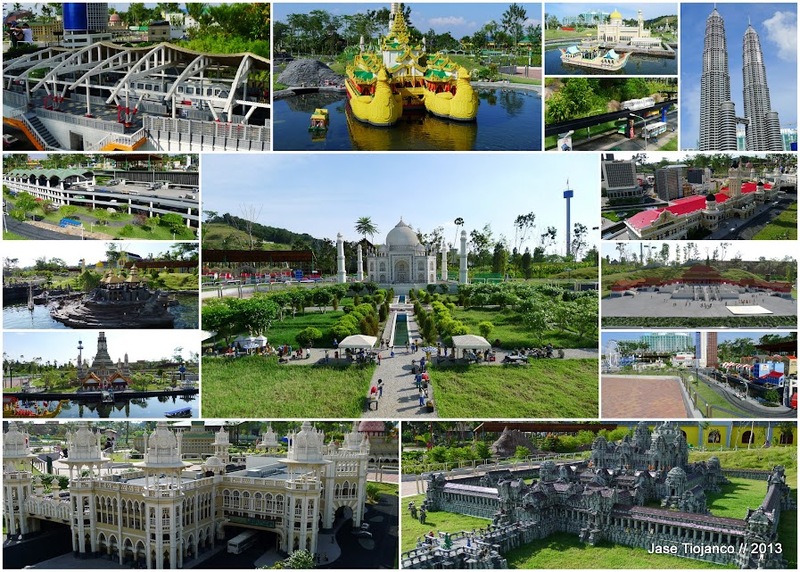 The ride revolves slowly to give you a view not just of Legoland, but parts of Johor Bahru as well. I think I enjoyed the park too much. Good thing there were kind people willing to take my photo. After going around the park, I went to the souvenir shops near the entrance to buy some Lego merchandise. I bought a Legoland polo shirt for myself for only 50 MYR. I also bought two Lego bag tags, one for me and one for my sister. Of course, my visit would not be complete without sampling the food. It was already near closing time and the staff at the Lego Cafe was starting to clean up. I ordered baked lasagna and pudding plus a glass of iced tea. The food I ordered were delicious! The pudding was fantastic in my opinion. Since it was a weekday, closing time was at 6 PM. 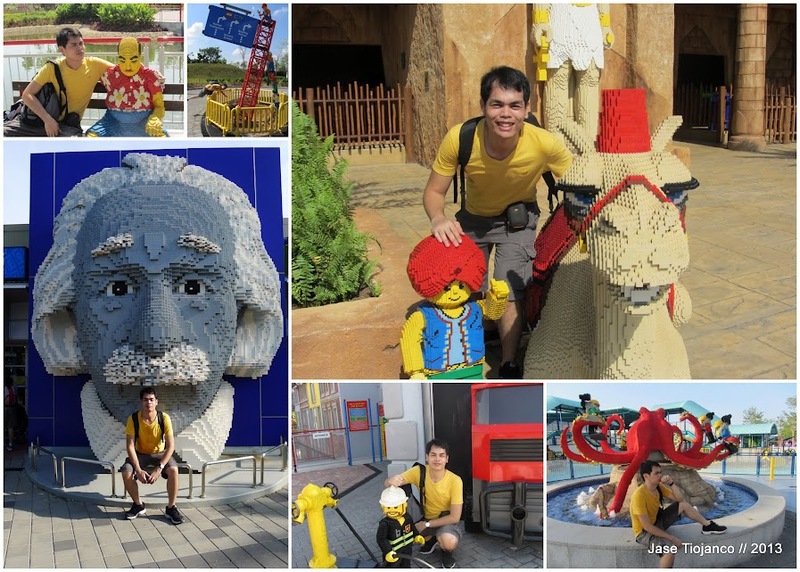 I was very satisfied with my short adventure to Legoland and I went back to Singapore with a big smile on my face. There are more attractions in the work and I hope I can visit the park again once the new ones are completed.